Published on June 19, 2016 by Martyn. Be the first to comment! I’m not easily excited but I’m very excited by the news that Twenty Questions for Gloria has been included in The Guardian‘s Best New Children’s Books Guide for 2016. The guide, which was published with Saturday’s edition of the newspaper (June 18th), is also available in independent bookshops throughout the country to celebrate Independent Bookshop Week. Books for children of all ages were selected and reviewed for the guide by a panel of booksellers from independent bookshops. 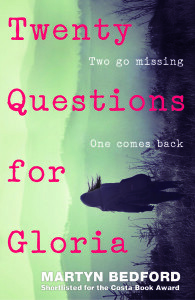 Twenty Questions for Gloria is one of just 25 titles for teenagers included in the ‘Fiction 12+’ section, rubbing shoulders with books from the likes of former children’s laureate Malorie Blackman, Carnegie Medal winner Tanya Landman, best-sellers Francesca Simon and Michael Grant, and this year’s Costa Book Award winner, Frances Hardinge.